The Samsung Series 3 300E7A is a mid range laptop, featuring an impressive 17.3" screen, complete with a speedy 2.1Ghz processor from Intel, and 6GB of RAM. Storage is catered for by an spacious 750GB hard drive, a DVD player and all the usual standard features that you'd expect at this rice range, such as a webcam, all operating on the robust Windows 7 Home Premium operating system. After a competitively priced laptop with a large screen for around the £400 mark? The 300E7A could be the solution to your problems - read on for our laptop review. Below is our review of the Samsung Series 3 300E7A, a 17.3" laptop, featuring 6GB RAM, 750GB hard drive and Windows 7 Home Premium . So you're looking for a mid range laptop, with a large screen and high specification? 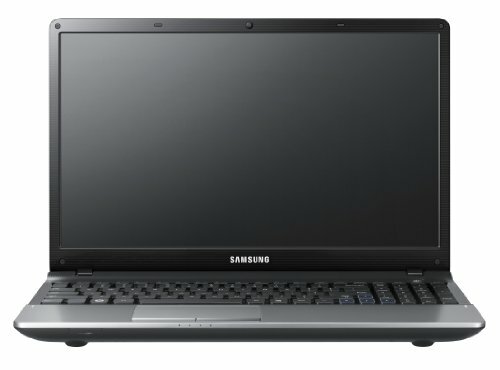 The Samsung Series 3 300E7A could well fit the bill - it features a massive 17.3" screen, and a decent specification - 6GB DDR3 RAM, 750GB Hard drive, and a 2.1Ghz Intel processor, and integrated graphics card. Samsung have been making laptops for a considerable amount of time, and are renowned for making functional and yet attractive and reliable electronic products. Therefore it comes as no surprise that the Series 3 300E7A design has clearly had a lot of thought put into it. Samsung's design team have been working hard to create a notebook which oozes quality, and looks far more expensive than it actually is - at first glance you'd assume this laptop costs far more than it's relatively small price tag. The clean lines of the exterior have a minimalist and designer style to them, and the whole notebook feels solid to the touch - no cheap materials have been used, and this is shown in how little flex the laptop has. Weighing in at around 2.5 kg, it is about average for a laptop of this price and size. The clean lines of the 300E7A laptop give the appearance of a sleek and slim machine - and the brushed metal exterior looks stunning - this helps prevent the laptop from looking unclean from the inevitable finger print marks. It's the little attention to detail like this that show that Samsung have put a great deal of effort and thought into their notebook range's design - many manufacturers save expensive features like these for their higher end ranges. Samsung have taken a leaf out of Apple's book by realising that form is important, as well as function. In fact the exterior is reminiscent of Apple's ranges - and if it were un-badged then chances are it would fool many users into thinking this laptop was in fact made by Apple, and not Samsung. At just 2.7 cm high, and a width of 40.7cm, it is slim and light enough to easily be carried around, making the 300E7A ideal for students and any other users who regularly have to travel or commute with their notebook. Of course, it is still a touch larger than the 15.6" equivalent laptop, due to having to accommodate the extra screen inches - however we did not notice this to be enough of a hindrance to put us off potentially buying one. having a larger screen also has it's advantages - this means there is more space for the controls, and as such the 300E7A has a generous sized keyboard spanning it's width. If you plan on making this laptop your main source of computing, then this is a definite advantage - you definitely won't feel hunched over the screen, and as such it will suit those users who have either larger frames or hands - no comfort issues here. The display itself is, as mentioned a major selling point, measuring a generous 17.3". It offers the usual Samsung quality, with a crystal clear display - Samsung also manufacturer high end televisions, and have done so for decades - this wealth of experience has enabled them to produce a high quality clear picture in even their low and mid range laptops. Users can adjust the brightness and contrast as required, which will help you to customise it to your preferred setting to reflect your environment. The keyboard is easy to use, and each key has an expensive and reliable feel and action to it. Long gone are laptops with keyboards with wobbly buttons - as with most modern notebooks, the 300E7A has been well built out of expensive materials, and this is reflected in the quality of the controls. If you plan on completing lots of word processing, then you will not have any issues with this laptop. Generous sized gaps run between each individual key, which is an added bonus, thus making maintaining the keyboard and keeping it dust free relatively easy, as well as helping to eliminate typing mistakes. A full-size number keypad is located to the right hand side of the keys, making this suitable for those who require regular numerical input, such as accountants and spreadsheet users - a nice touch. The touchpad, as you'd expect from Samsung, is well made, and a pleasure to use - offering accurate control whilst the built in wrist rest provided us with comfort during our test period - no complaints here whatsoever. Onto the actual specification of this laptop - the 300E7A offers a generous 750GB hard drive - which should be more than enough for all of your personal and work files, as well as music, movies and software. 6GB of Ram helps keep tasks running smoothly, and the Intel Pentium B950 2.1GHz processor performed well in the tests we performed - no laptop is ever going to be future proof due to the nature of all technology products - however this offering from Samsung should provide you with years of use. In terms of connections, you get 3 USB ports, an HDMI slot, VGA, headphone and microphone, as well as an ethernet port if you'd prefer not to connect via the inbuilt WiFi. Battery life is pretty good - obviously due to the extra screen size, this laptop is not going to perform as well in terms of battery life as a smaller 15.6" laptop - larger screens require more power to run. However we found it to be good - the notebook includes "BatteryLife Plus" - a feature exclusive to Samsung which they claim "ensures that your battery keeps 80% of its original capacity for up to 1000 recharges". We have not been able to test this, but it's reassuring to think that Samsung have designed this machine to be used for such a time period. Speakers are pretty good for a laptop - however for audiophiles and music enthusiasts, you may well wish to purchase a set of decent headphones or external speakers. Operating system is catered for by the reliable Windows 7 Home Premium (64 bit) - we won't go into depth into this feature simply as this will be fairly standard for laptops of this price range, regardless of which notebook manufacturer and model you decide upon, with the obvious exception of Apple. Pros: Featuring a large screen, the 300E7A is a well made, and beautifully designed laptop with a decent specification - ideal for students and home users alike. Offers good value. Cons: Larger screen will mean less battery life - so perhaps not ideal for long travelling periods. Overall - to conclude, the Samsung Series 3 300E7A is a well priced laptop, with a decent sized screen, and ideal for those on a budget around the £400 mark. With a spacious hard drive, and plenty of RAM, this laptop should be able to handle most tasks, and is worth considering if it falls within your budget.